Federal Reserve Chairman Ben S. Bernanke gave a speech on January 3, 2010 that was incomprehensible. The address itself will be discussed later. It is important first to consider the precedent of Federal Reserve chairmen making absurd claims  and getting away with it. A place to start is Alan Greenspan’s 2002 speech in Jackson Hole, Wyoming. The then Federal Reserve chairman explained that central banks could not identify bubbles because "only history books and musty archives gave us clues to the appropriate stance for the policy." There are several problems with this excuse, not to mention his even less credible fiddle-faddle. More important though, is that the chairman’s address was disseminated with very little opposition along channels of communication. Economists cheered or remained silent. With a few notable exceptions, the media reported Greenspan’s speech as if it was a press release, which it was. More up-to-date is Alan Greenspan’s appearance before Congress in October 2008. He had left the Fed in January 2006. In 2008, he testified about his contribution to the worldwide financial meltdown. Greenspan was "shocked" to find a "flaw" in his "ideology." He discussed his model that impugned "40 years or more of considerable evidence." His model miscalculated the "self-interest of lending institutions" that he believed protected shareholder interests. Greenspan explained his navet was the reason he had not regulated banks properly. Greenspan’s mistake was so often repeated that it acquired an official status. There are (at least) three official bodies that profit from this hallucination. First, the politicians. Since the Federal Reserve is the nation’s leading bank regulator, the politicians who inflated the credit bubble (e.g., through Fannie Mae, Freddie Mac, Countrywide Credit, banks that securitized mortgages, the National Association of Homebuilders) have not been held to account. The politicians are free to toy with petty financial regulation, while Fannie, Freddie and lethal derivatives are compounding as before. The second body is the Federal Reserve. In a more mature world, after such a display of catastrophic incompetence, the Fed would be disbanded. Instead, since Greenspan’s mistake was due to his model’s flaw (not a fault of the former Federal Reserve chairman) and because bankers’ standards of integrity fell so far below Greenspan’s impeccable conduct that he could not comprehend such behavior, the Federal Reserve has been handed a parking ticket. The third body is Alan Greenspan. He has been exempted from his responsibility for the ongoing liquidation of America. The former chairman has received blame, but still receives accolades. Greenspan continues to speak for large fees. His prophecies are still quoted across the media and the recently endowed Alan Greenspan Chair in Economics at New York University demonstrate that groveling can get you anywhere. Greenspan has remained relatively unscathed because he is still useful. In this case, to the politicians and every economist who is using Greenspan’s error to promote more regulation. There will be many opportunities for both politicians and economists to get rich from new legislation. Alan Greenspan’s self-proclaimed "ideology" is essential to his innocence, to the Fed’s exemption from failure and to the politicians’ fevered attempts to separate themselves from responsibility. Despite the incessant noise about Greenspan’s ideology, he never had one. He’s never even had an idea. The publicity is of a man who acquired his free-market ideology sitting at the feet of Ayn Rand. This is reported over and over by the media. He didn’t know what Rand was talking about. 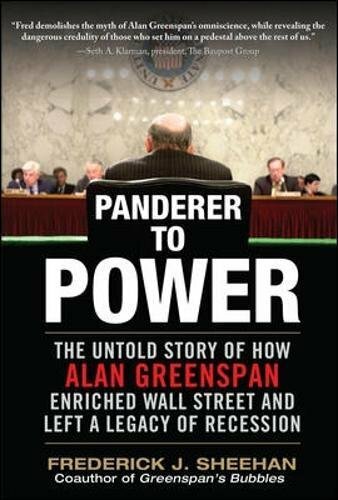 Nathaniel Branden, Rand’s number one acolyte in the 1950s and also the Randian closest to Greenspan, wrote years later: "Now, looking at [Alan], I wondered to what extent he was aware of Ayn’s opinions." Complimenting Ayn on some passage, Greenspan might say, "On reading this…one tends to feel…exhilarated." Platitudes and assurances also mesmerized the nation 50 years later. Today, for the media to suggest Greenspan did not operate from a free-market ideology would throw open the question of why Greenspan blew up the banking and credit systems. It would introduce the possibility that he was prone to act as the large financial institutions would like him to act. It would also reveal the extent to which he  and Bernanke  say what politicians want them to say. On January 3, 2010, Federal Reserve Chairman Ben S. Bernanke stated low interest rates set by the Federal Reserve from 2002 to 2006 did not play a part in the housing bubble. Instead, he claimed, it was loose regulation that has left a good part of the country on the cusp of poverty. This interpretation cannot even be classified as poor economics, but it is good politics. In January, the Senate is scheduled to vote on a second four-year-term for Bernanke as Fed chairman. Like Greenspan, Bernanke is useful. He will probably receive another term. Are You Ready for a Fascist America?